Sprinkle the eggplant slices with salt, leave them for an hour, rinse and dry them. Fry them brown in hot olive oil on both sides. Set them aside. Fry the onions and the garlic for 5 minutes, add the tomatoes, the cumin, the nutmeg, the raisins and pepper and salt to taste. Bring this to the boil and simmer for 15 minutes. Add the eggplant slices and heat for a minute. 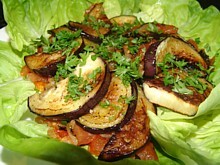 Arrange the lettuce leaves on a plate and spoon the eggplants and the sauce on top. Sprinkle with coriander and mint. 22 May is Unity day in Yemen, because North- and South-Yemen united in 1990. Click on culinary calendar for more links between cooking and celebration. Stir, for the dressing, 3 tablespoons olive oil together with the vinegar and pepper and salt to taste. Stir fry the bread cubes in the remaining oil together with the garlic until they are golden brown. Stir fry the bacon in a separate pan for 10 minutes on medium heat. 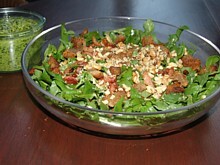 Put the dandelion leaves in a salad bowl with the walnuts, sprinkle the dressing on top and toss; add the croutons and the bacon cubes. Another recipe with dandelions is dandelion pesto. Dandelion (Taraxacum Officinale, family of the Asteraceae, just like Common Daisies), is found all over Northern and Western Europe and the United States. As a child I believed, that if you manage to blow all seeds at once, you will be 100 years old. The name comes from "dent de lion", lion's tooth in French; but when I ordered "Salade Dent de Lion" whilst skiing in France, it was just a salad named after a local mountain with that name, because the salad there is called "pissenlit".